Here’s another tangle pattern from our Taiwan tangling friends. Hsin-ya Hsu is Mei Hua Teng’s (Damy) daughter, and she’s named her tangle Znzu for reasons which will become evident. She shared the lovely Croscro tangle with us recently. I’m sure everyone who’s signed up for the two upcoming certification training seminars (CZT) later this month is very very excited, and that includes these two ladies. Hsin-ya illustrates the step-by-step instructions for drawing Znzu below. 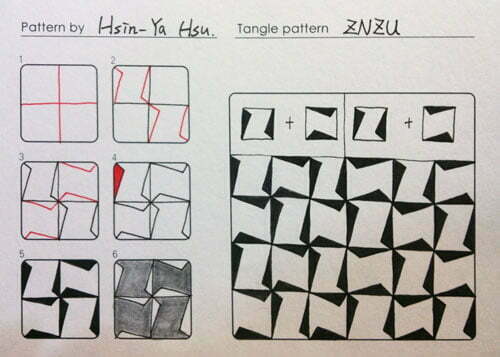 The tangle gets its name because it can either be drawn with the combination of (Z + N), or (Z + U) as Hsin-ya demonstrates side-by-side on the right below. The difference is very subtle. This is an op-art type of pattern because sometimes you notice the letters, and other times the “pinwheel”-like sections of the tangle pop out at you. Well, it did to me anyway. 🙂 Try squinting at it. (Yes, I know I’m overdue for an eye exam.) Have fun! Check out the tag hsinya for more of Hsin-ya’s tangles on TanglePatterns.com. Thank you for the site. I have started and stopped several times over the years and it is nice to be able to pick up again. Especially when winter will put an end to the garden.